In his second letter to the young pastor, Paul says to Timothy, in so many words, “Do not be ashamed of Jesus’ name. Or of His people. Especially those who are persecuted because of their boldness to proclaim the very truth that you are also to proclaim!” There has always been a temptation to avoid association with Christ if it means we may be persecuted. How many of the disciples scattered when Jesus was arrested? All of them. How many believers stood with Paul in Rome when he was put on trial for his life? Not one. We may have a hard time understanding the context of severe persecution because people in the U.S. are not arrested for preaching the gospel and talking about Jesus. Not yet. We all rejoiced over the release of Pastor Yousef in Iran two weeks ago. He had been imprisoned for three years, waiting to die for preaching the name of Jesus. I praise God that there was an international outcry. But the story may not have an ending yet. Last week, I read that a similar thing happened in Iran in 1993. A pastor was arrested and sentenced to die, and the bishop of his denomination initiated a successful international campaign to get the pastor released. The bishop was executed three days after the pastor was set free. Six months later, the pastor was also executed. Perhaps some raw honesty is needed here. The vast majority of Christians in this country tend to be embarrassed when they see someone preaching on the sidewalk. Or witnessing to strangers and handing out tracts in the park. Or even bowing their heads at a restaurant to pray before a meal. We flee persecution of any kind, even if it means we compromise the truth of the gospel through our shame. 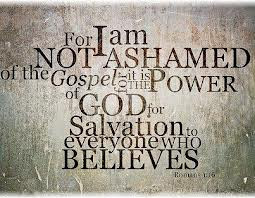 Do not be ashamed of the name of Jesus or the truth and life only he can give. Without the gospel, there are no answers. With all due respect, I'm not sure this critique is entirely fair. While I, and many others I'm sure, can readily appreciate your sentiment, I have to admit that I can definitely be lumped into the category of people who cringe when I see the corner street preacher, or the person trying to force a tract into the hands of passing pedestrians. That said, its not because I'm embarassed or ashamed of my Christianity, its simply because I would say those sorts of presentations are not compelling or even relatable to average person. I would also say that your own example of sharing the gospel in a closed country was itself an example of an organized venue where people chose to attend, and people chose to ask particular questions for the speaker to answer. Ramsden was invited, and the organizers prayed for an opportunity to share the gospel- God provided the opportunity. I think its a bit unfair to compare the story of a question posed by a person in an organized venue, closed country or not, to a situation where uninvited solicitation is put forward as a credible way to engage people. Does Jesus Cleanse the Temple? Theologian Trading Cards: 5 Years Later!